This was a live album not really intended for release. The recorded live tracks eventually came out on this abridged version of a live show containing only six tracks, but a fair old slice of rousing live atmosphere from Elton and his three piece outfit, with Nigel Olsson on drums and Dee Murray on bass. 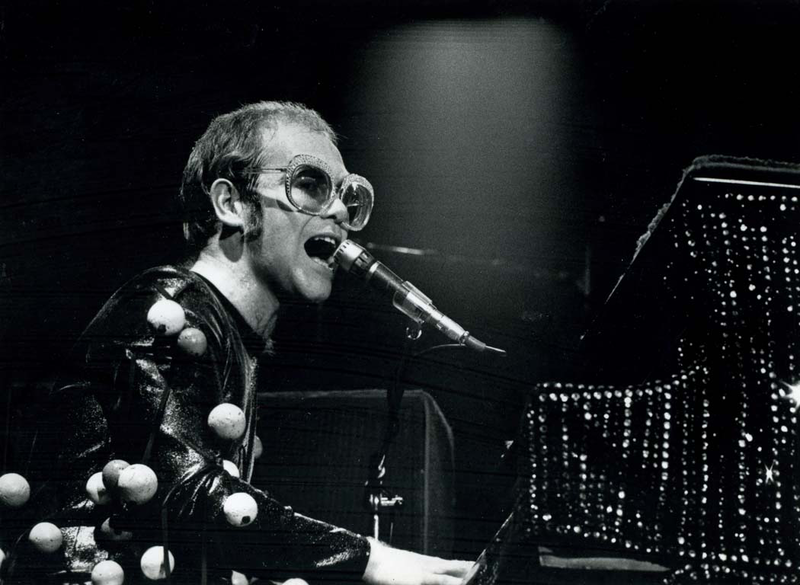 Elton has stated in interviews since that he considers this to be his finest live album. It certainly highlights just what fine musicians Olsson and Murray were at the time. Guitarist Davey Johnstone didn't join the band until 1972. The later, remastered edition, the one I have, contained an extra track ("Amoreena)". 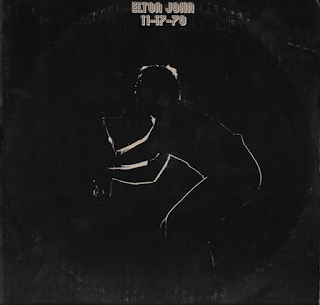 This was also recorded in the period when Elton John was bigger in the US than he was in the UK, which was certainly true at the beginning of his career. So, on to the album. 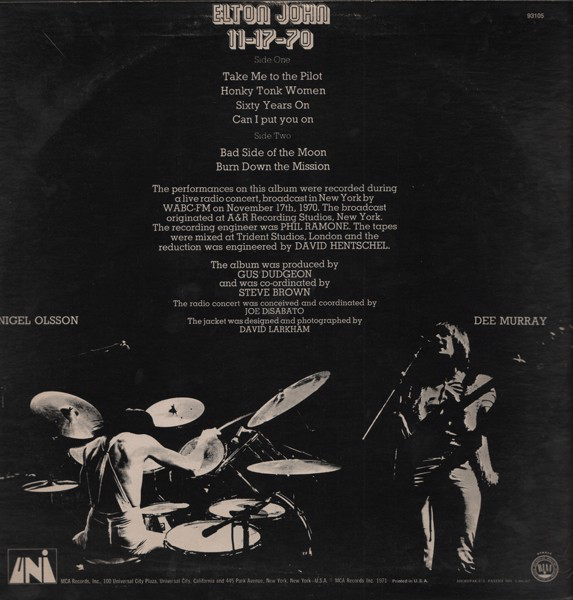 It kicks off with the muscular, thumping power of the rousing "Bad Side of The Moon". The bass is huge and the drums resonant and solid. Add Elton's clunking piano to that and you have one hell of a full, pulsating sound for a three-piece. His vocal is also outstanding too, full of bluesy grit. "Amoreena" continues that classic early seventies Elton John bluesy groove. Nigel Olsson's drumming is on fire on this one and Elton's piano at its rollicking, melodic best. There is a real energy and attack on these live cuts, an enthusiasm that you get in someone at the start of their career. Comparatively youthful verve and vigour. "Take Me To The Pilot" is a piano and drum driven ball of funky, staccato energy. Sure it is a bit raw and edgy, but therein lies its rough and ready appeal. Elton's piano work is outstanding on here. "Sixty Years On" is as evocative as it is on the "Elton John" album. The drums on it are absolutely powerhouse, possibly too much so, compared to the original, but it suits the tone of the album. The band's cover of The Rolling Stones' "Honky Tonk Women" is given the full bluesy bass, piano and drum treatment and, funnily enough, it works, without any guitar riffage. Elton's vocal suits the song perfectly. "Can I Put You On" is a classic of Elton John's style from this period. It never appeared on an album apart from this live cut, which was a shame. 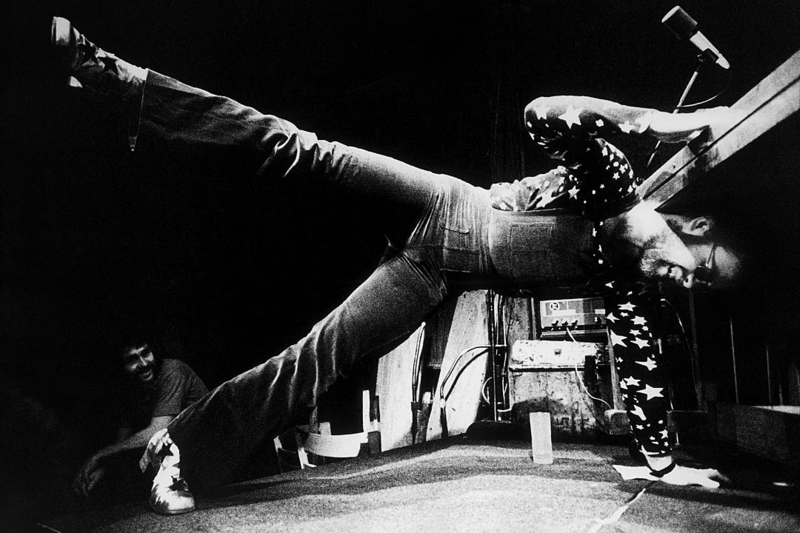 It has that driving piano-driven bluesy sound that characterised so much of his output at the time. The final cut, the mighty and dramatic "Burn Down The Mission" lasts a full eighteen minutes and includes diversions into "My Baby Left Me" and "Get Back". Despite is length, however, it never loses your interest. Some great interplay between the three musicians in it. 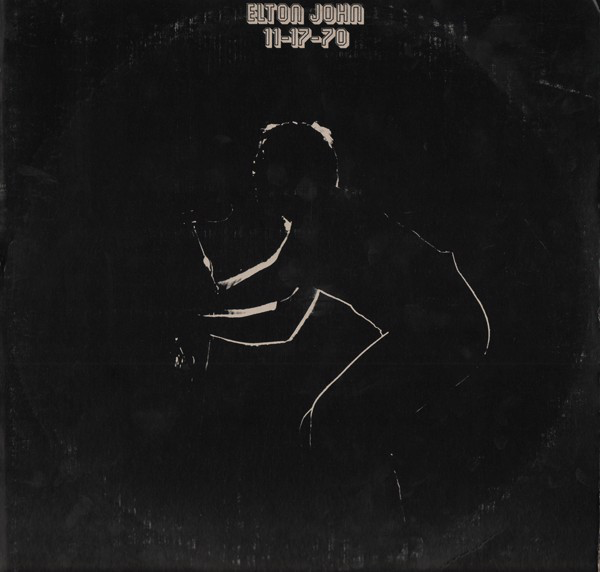 Overall, this is one hell of a quirky little live album from a time when Elton John was not a huge superstar. Highly recommended.